Former writer for David Letterman brings entertaining show to Dallas Aug. 4. “The Lost World of Industrial Musicals,” celebrating the little-known genre of internal corporate musical propaganda, comes to the Texas Theatre August 4. Steve Young, author/collector/historian and former “Letterman” writer, hosts this hilarious evening of entertainment, featuring lost gems like GE’s “Silicones, Silicones” and American-Standard’s “My Bathroom.” The one-night-only show starts at 7:30 p.m. at the Texas Theatre. Tickets are $12. 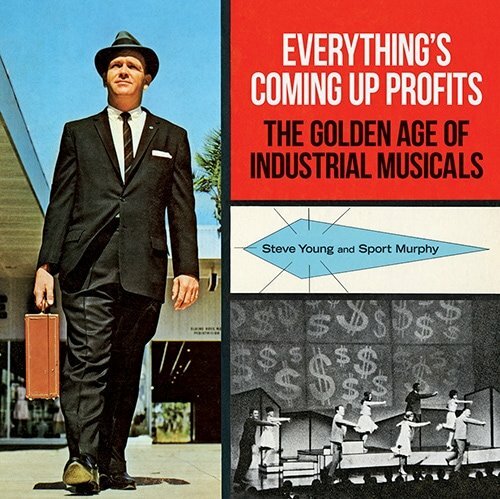 The show is an outgrowth of “Everything’s Coming Up Profits: The Golden Age of Industrial Musicals,” the book co-authored by Steve Young. From roughly the 1950’s to the 1980’s, corporate America commissioned tremendous numbers of lavish Broadway-style shows for conventions and sales meetings, not open to the public. This mutant showbiz genre was all but unknown until Steve began collecting the rare souvenir albums while gathering material for the “Dave’s Record Collection” segment on the Letterman show. Twenty years and one book later, he owns hundreds of scarce records, and has met and interviewed many veterans of the industrial musical scene. And now, the next frontier: industrial musicals on film. Steve Young has presented this unique show in New York, Boston, Los Angeles, Chicago, Minneapolis, and other cities. He’s appeared several times as a guest on the Letterman show. He’s also been on NPR’s “Fresh Air” with Terry Gross, and at theater festivals and business conventions introducing audiences to a slice of Americana that’s unexpected, weird, funny, and ultimately even inspiring. Steve Young is a 25 year veteran of the “Late Night” and “Late Show with David Letterman” writing staff. He has also written for “The Simpsons” and has most recently been writing for NBC’s “Maya & Marty.” With Sport Murphy, he co-authored “Everything’s Coming Up Profits: The Golden Age of Industrial Musicals“, published in 2013 by Blast Books. He is part of an industrial musicals documentary now in production, with David Letterman as an executive producer. The Texas Theatre, a Dallas landmark dating to 1931, features classic, independent, and horror films and special events. Tickets to “The Lost World of Industrial Musicals” are $12 and can be purchased at the door or through the Texas Theatre website.